Here's the thing about the emissions which cause global warming: You can't see them. Picarro wants to use a Google Street View-like fleet of vehicles loaded with the company's technology to drive around cities measuring emissions so that the gasses can be plotted onto detailed 3-D maps. It turns out that while we have data about emissions at the atmospheric scale, measuring them at a small scale is actually really hard. That's where Picarro's CRDS analyzer comes in, reports TreeHugger. The CRDS analyzer is basically an infrared sensor that can "see" the emissions from a particular source. 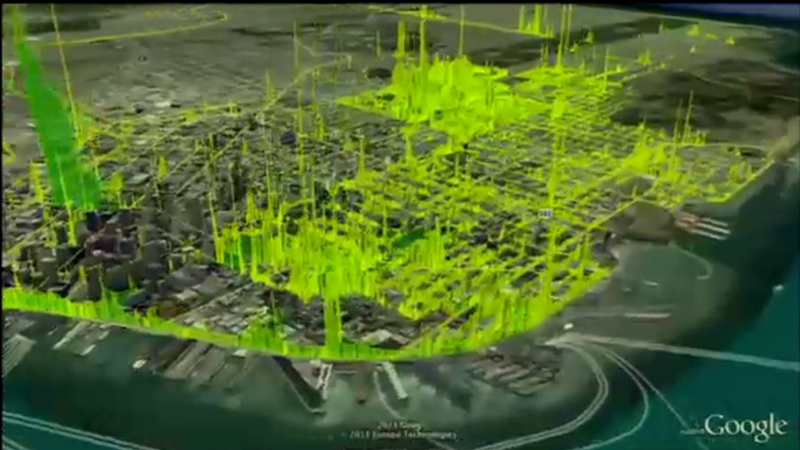 Take for example, the above visualization of emissions in San Francisco. As the emissions-sniffing cars drive around a city, analyzer on board, they beam information back via satellite. This information can then be used to make crazy maps that show the way emissions are ejected from sources over time.